Click the button below to add the HP 1113 Plain & Simple Relaxed T-Shirts to your wish list. modal, silk, bamboo, merino & cashmere. boat-neck for your personalized, one-of-a-kind T-Shirt shape. blouse it over the waistband. Gorgeous! For the solid-colored body, long sleeved version, all sizes need around 2 yards /184cm fabric. For the bi-colored, short sleeved version, all sizes need around 1 yard /92cm fabric for the upper bodice & sleeves, plus another 1 yard /92 cm contrast fabric for the lower bodice. For the color-blocked, 3/4 sleeved version, all sizes need around 3/4 yards / 69 cm of fabric #1 for the upper bodice & sleeves, plus 3/8 yard / 32cm of fabric #2 for the mid section, and ½ yard /40cm of fabric #3 for the lower section. I like these patterns as they are close to my true size. 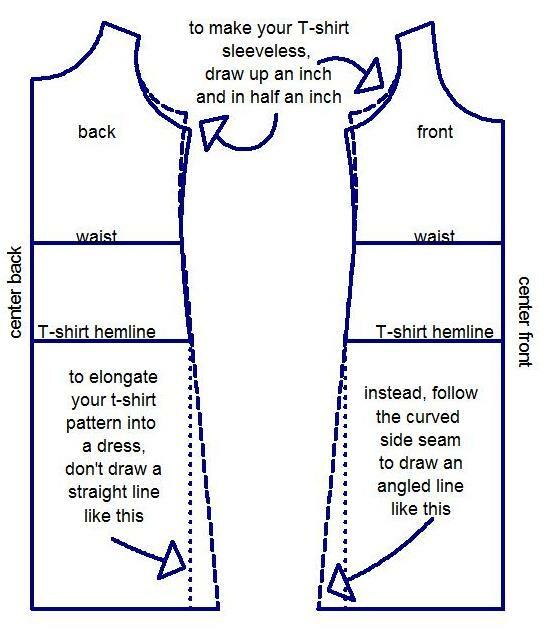 The t shirt pattern is versatile and looks great. I've made six of these over the past couple of years and plain to make more. Always the boat neck with long sleeves; I love the slightly too long, slightly narrow sleeve. Sometimes I use a contrast fabric for them, sometimes a contrast fabric for the neckband...fast, easy and looks great. What's not to love? I bought this pattern because there are some drapey vicose knits with patterns that I love but would be too much alone. So far I've made a fit muslin, and cut a size smaller than usual (from an 8 to a 6) and it is still quite generous. Haven't yet cut into the beautiful vicose print and matching solids yet, and am studying the pattern drawings to figure out why the fabrics on the cover work so well together and how to arrange mine, both for the overall effect and to get face-flattering color near my face. Help with fabric choice and the styling of the finished clothing is important to me, and your videos help a great deal. Also love when you mention a fabric source that's really good. Great fit and fast to sew! This t-shirt is great. I have started sewing for me again after discovering how fun it is to buy apparel fabric online. The ease of construction was a pleasure. The flat sleeve install is genius Trudy, and hangs beautifully. 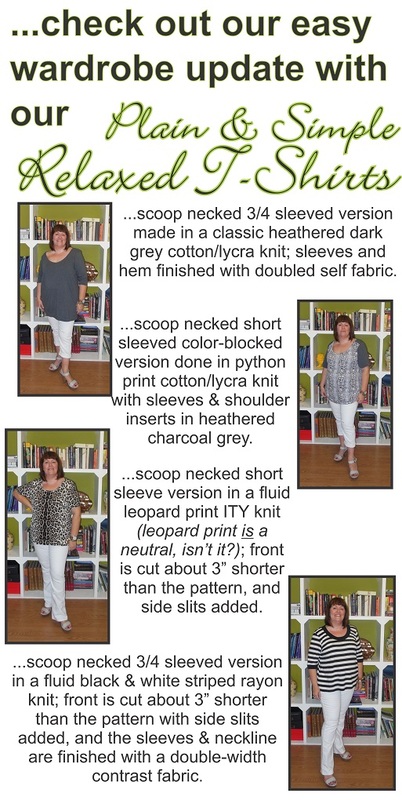 The neckband was time consuming on the scoop neck but I think that is a function of the fabric weight. Pinning was a necessary evil. My traced pattern is ready for my next creative moment and will be colour blocked. The best thing about this adventure was that the top looks like the drawing and I feel Fabulous! I like the way this shirt fits. The only thing I had a problem with is the V neck was a little low so next time I will adjust it some. I cut two sizes smaller than usual, because I didn't want it too big. Choosing the right fabric (fluid, drapy) is essential. I used a mix of linen and rayon knits to create the color-blocked version. It's the perfect dressed-up tee that's secretly comfortable! I have made about 5 of these shirts so far. I love the way they fit. They are plenty big and very comfortable. I make the full length sleeve and they seem to be fitted perfectly to wear the sleeve pulled up a bit as I like, slightly snug in the lower arm. I have made them with pockets, without pockets, I put rivets on some pockets. I just love this shirt and keep making more. So far I have not made the color block one which is what I was originally attracted to but I am excited to do that. i made the boat neck, the v neck, but mostly the scoop neck. I use my serger and it is finished really quick. Love!! I love the look of this top and couldn't wait to make it! I just had a hard time getting the neck opening correct. I think it's just my lack of working with knits, but I'll keep on trying! Great relaxed T- shirt with so many options! I like the slouchy style, and I like the various color blocking options you can choose. Going down a couple sizes this top is just right with the amount of ease and it has such a fun casual look that can be worn so many ways. I like the loose flowy look to it. Actually, I would like to lengthen this into a dress. I made mine in a pretty ITY knit and plan to make several more! I have now made 3 of these Ts and will make more! I can now make a T that I love in 3 hours - and that includes cutting time! The only modifications I had to make was cutting a size smaller than I expected (no real hardship), and raising the neck line on the V-neck. The 2 Ts I made of T-shirt jersey were beautiful, but the cotton interlock T seemed a wee bit sloppy with the heavier knit, so I added a front and back center seam to bring it in a bit - and like it even better! I'm wearing it as I type. The sleeves and neck binding fit in with out being fussy, and though a relaxed fit - the pattern isn't at all sloppy. Great Job!